In movies, we see astronauts in space consuming pills rather than eating meals. In reality, they currently eat freeze-dried rations that, according to most astronauts, aren’t the tastiest meals. 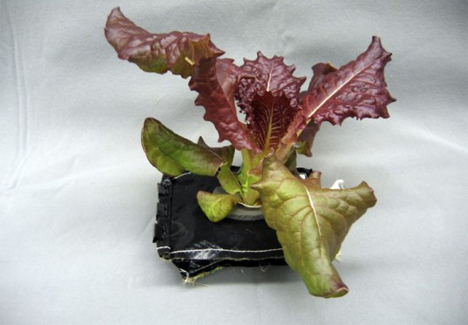 In the future, they may be able to pick their own fresh vegetables right from a garden aboard the International Space Station. When a SpaceX resupply rocket launched to the ISS in April 2014, it took with it a vegetable growth chamber that would allow fresh vegetables to be grown and observed in orbit. The expandable chamber, dubbed Veggie, will use “root pillows” to grow “Outredgeous” lettuce seedlings. The chamber is low-cost and collapsible, able to travel almost flat and then expand upward up to 18 inches as the plants within it grow. The Veggie is the largest space growth chamber to date with a growing area that is 11.5 inches wide and 14.5 inches deep. 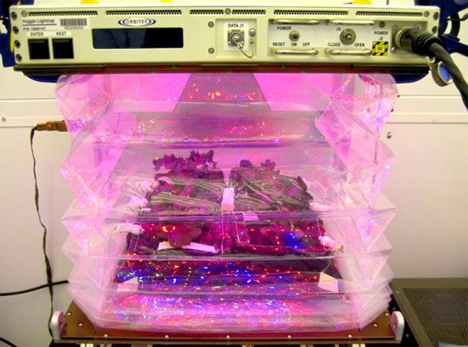 A bank of red, blue and green LEDs encourage plant growth and let crew members observe the plants. Studies on plant and animal growth in space have been conducted in the past, with some finding that insects born in space have a hard time adjusting upon their arrival on Earth. 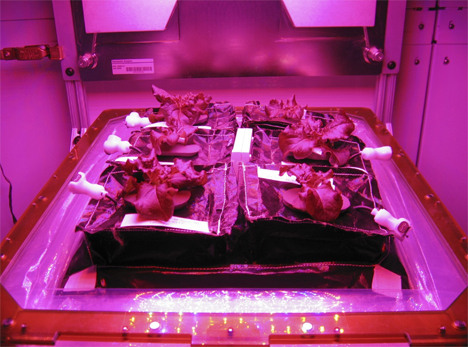 The goal of the Veggie project is to determine whether it will be possible to grow fresh food for sustenance and for recreation during the long-duration space missions NASA hopes to launch in the future. What’s the worst that could happen? We’re imagining huge, sentient heads of cabbage taking over the ISS and conquering Earth…but we’ll have to wait and see. See more in Space & Time or under Science. June, 2014.